The Twilight Star quilt block is based on the Ohio Star block with more patches added in the corners. The block features half square triangles and quarter square triangles -- both extremely common patches in quiltmaking. 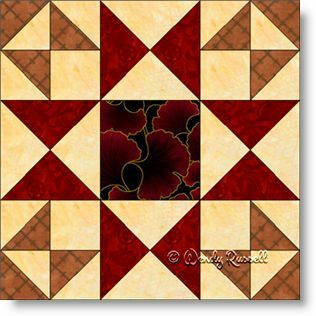 There is nothing difficult in the making of this quilt block other than it has lots of pieces, therefore, more seams and so you must pay close attention to sewing an accurate seam allowance. This nine patch quilt block is wonderful when you choose to make it a scrappy version. Just make sure to have lots of contrast in your chosen pieces. Here are two sample quilt layouts, both with the blocks set on point, but by simply changing up the background colour here and there, you get two very different quilts.